The East Indiaman Gotheborg was well armed for defense. Initial archive research seems to indicate she was equipped with 30 cannons. The tremendously valuable cargo still appears to have drawn surprisingly little attention from pirates. The cannons were mostly stored away in Northern waters and were only brought out when danger threatened. During the excavation large amounts of cannon balls, cartouches and other military items was found at the aft section of the wreck site. Canons were never used on board a Swedish East Indiaman for anything except salutations. The number of canons varied over the years so that in the early 18th century the canons were small and many after which they got less but larger. During the period 1731-46 the number of canons varied between 20-30 while by the end of the century the number of cannons were between 8-20. 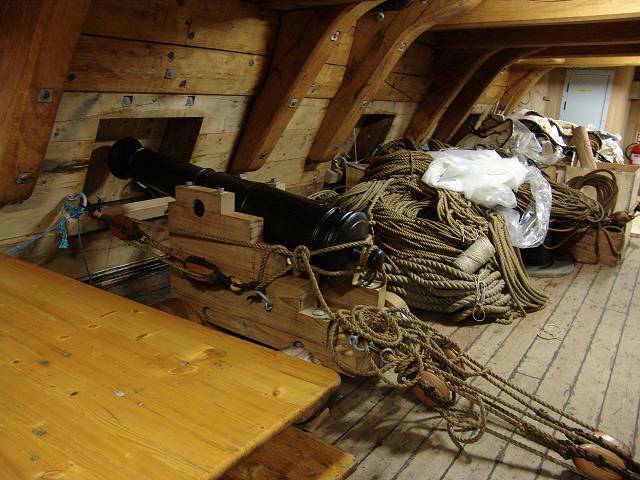 In 1739 Riddarhuset were carrying four 8 lbs, twenty 6 lbs and six 3 lbs = 30 cannons which all in all were 170 lbs while by the end of the century Terra Nova, 1777, carried eight 12 lbs and ten 6 lbs = 18 cannons which all in all were 156 lbs. During one trip (Adolph Friederic, 1746-48) to Canton and back according to Reinius' Journal 348 salutation shots was fired plus eight full salvoes, to celebrate the birthday of the Danish Queen. The 16 reconstructed 6 lbs cannons on the East Indiaman Gotheborg was cast by DAROS in 1996 in support of the project. Their weight is 700 kg and would take a charge of 1.5 kg of black powder to be fired. Picture from the reconstruct East Indiaman Gotheborg III. Photo: Jan-Erik Nilsson, May 30th 2005. A normal salutation 'salute' would be fired by eight blank shots, while calling for pilot would be done by firing one shot. At some occasion there seems to have happened that a salutation in China was actually fired with sharp shots and that one cannon ball actually killed someone on land.